We’re all about good causes and with February set as American Heart Month, T-Mobile is doing its part to help give back. The purchase of any of the red accessories pictured above will lead to a $1 donation for each accessory purchased. T-Mobile will give up to a maximum of $50,000 before the offer express on February 28th. 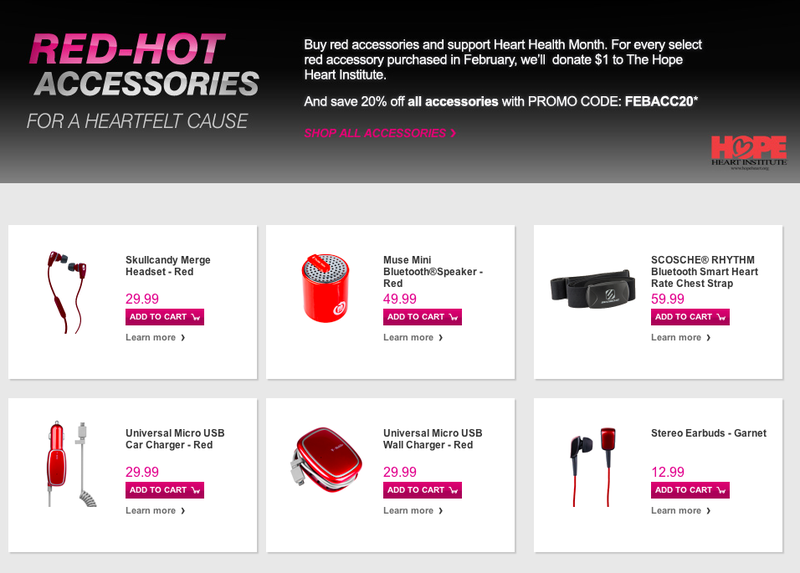 Along with the red accessory promotion, T-Mobile is offering 20% off all accessories through March 21st using promo code: FEBACC20. Support a fantastic cause and pick up a red accessory today. When we start justifying cost like this then this economy will never turn around. Look more to the cause than cost my friend. Or just think of it as you are donating a dollar to the charity. That’s another way of doing it. But be mindful that there are additional cost that goes into products of this kind, generally to create the awareness and publicity it deserve. Don’t get me wrong, for T-Mobile can donate without selling these items. But that shouldn’t stop you and I to donate for a just cause. What v that guy said. I’d rather just donate to the charity. I think T-Mobile (or any corporation for that matter) makes enough money to just say “hey look we’re gonna donate X amount now!” to charity. I was just offering another option to look at it. My take to was more of not looking at cost of production as that’s not the only cost associated with products. LOL a maximum of $50k? I thought the same thing. Haha. A drop in the bucket for them, really, & they still feel the need to cap it off. at our store, we offer a 1 year warranty on our accessories, because we know that 29.99 for a charger is too much. $30 for a freaking charger?, what is it made out of, gold?